I don't have much to say here other than this soup is awesome. Super easy and, paired with this chutney, unbelievably tasty. The combination of flavors just works. Kinda spicy, kinda sweet, kinda salty, kinda tangy - you've got it all here. 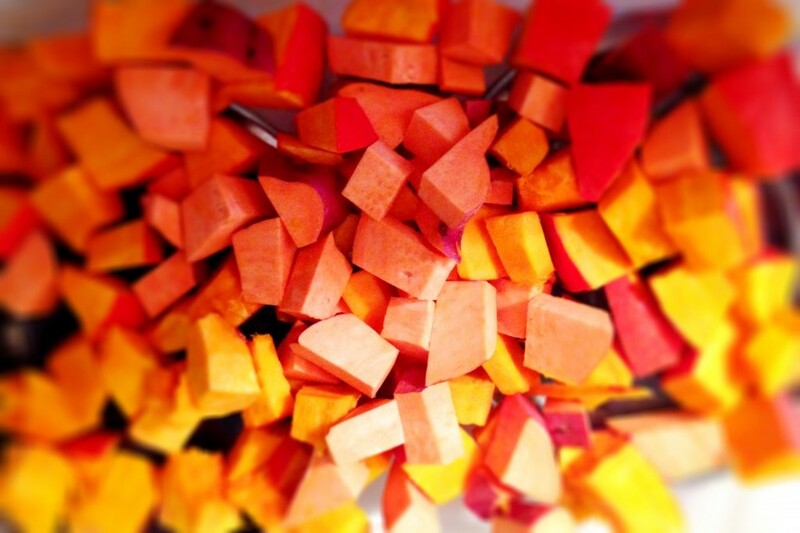 Squash season is upon is, which means I'm pureeing it into soups a couple of times a week. It's so simply perfect for a cool fall evening. And it's pretty tough to mess up. Chop it, roast it, then blend it with some liquid (broth, milk, or milk alternative) and your favorite spices, and you've got yourself a meal! I used a combination of Red Kuri squash and sweet potatoes here, but you could really use any hard winter squash you had on hand. The chutney provides a lovely kick to the soup, but you could also use it on top of plain roasted squash and even stirred into cooked rice or other grains. If you follow Ayurveda, this chutney is considered tridoshic, which means it can be enjoyed by Vata, Pitta and Kapha constitutions. Combine squash, sweet potato and water in a large baking dish and cover with tin foil. Bake at 375 degrees for 45 minutes. Liquid should be absorbed and squash should be tender (not dry) when you remove it from the oven. Toast cumin seeds in a small frying pan over medium-high heat until fragrant, giving the pan a shimmy-shake every so often so seeds don't burn. Next, combine cooked squash/potato with cumin seeds, coconut milk, sea salt and curry powder and blend until smooth. Serve with a healthy dollop of Cilantro Chutney. Combine all ingredients in a blender and blend until somewhat smooth (it should resemble a pesto texture).